Designers pulled inspiration from nature this season with intricate floral patterns and bold blooms. Though not a new concept, the execution for Spring 2018 was a fresh take on the look we’ve seen evolve from season to season. Badgley Mischka paired textured fabrics, fringe, and floral appliqués with a variety of both colorful and monochromatic blooms. Beautiful linear earrings draped shoulders left bare by strapless gowns. 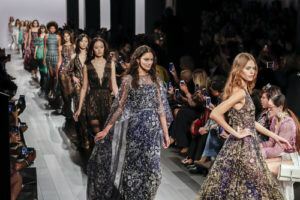 Zimmerman’s spring collection, sweet and feminine, was beautifully complimented with petal-adorned gold chains that seemed to float from ear to the décolletage, often continuing on in waist-length lariats. Pearls are timeless. Pearls are classic. This year, designers created a whole new aesthetic, shattering the buttoned-up, traditional idea of pearls. Layers and layers of pearls on the Marchesa runway served as beautiful embellishments, often sewn directly into gowns and ensembles. Standout looks included long lines of pearls and crystals that transformed plunging necklines. Prabal Garung engineered a mix of free forms in metal adorned with diamonds and pearls. Alexander Wang made natural baubles rock-n-roll ready, mixing black pearls with chain and leather. The statement earring absolutely dominated the spring runway. Marc Jacobs and Brandon Maxwell featured intensely vivid hues, perfected by the statement earring in a variety of interesting shapes and sizes. Several designers played with heavy metals. Ralph Lauren accessorized sleek leather contours with a variety of chrome collar necklaces. Dion Lee’s use of multiple metal ear cuffs was contrasted by oversized, dramatic hoops in the Fenty Puma by Rihanna show. Perhaps the most exciting takeaway from NYFW spring 2018 runway this year: every trend is attainable. Take inspiration from bold hues, exaggerated lines, and feminine silhouettes. Dress up your black blazer for an office meeting with a turquoise drop earring or fire opal pendant. Elevate your evening attire with floral pave stud, or linear, diamond-studded earring. 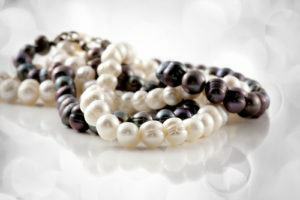 Layer your heirloom pearls. Add a classic hoop in gold or silver, metallic or matte. Even the simplest bit of sparkle can finish your look. Take some inspiration from the runway and let Dominion Jewelers make some of these beautiful trends your own.